Kia's design chief Peter Schreyer, 59, was appointed as President to oversee Hyundai and Kia's design centers in order to streamline its resources and create synergy between the two brands.thus, becoming the first non-Korean to hold that title in Kia's history. Schreyer joined Kia in 2006 from the Volkswagen Group to lead Kia's design transformation and will keep that role of Chief Design Officer in addition to being one of three Kia presidents. Schreyer, originally from Bavaria, is based in Frankfurt, Germany, married with two children. He studied at the Royal College of Art in Germany before becoming part of the Volkswagen Group's design team and contributing to the distinct appearance of several VW and Audi models including the Passat and the Audi TT. 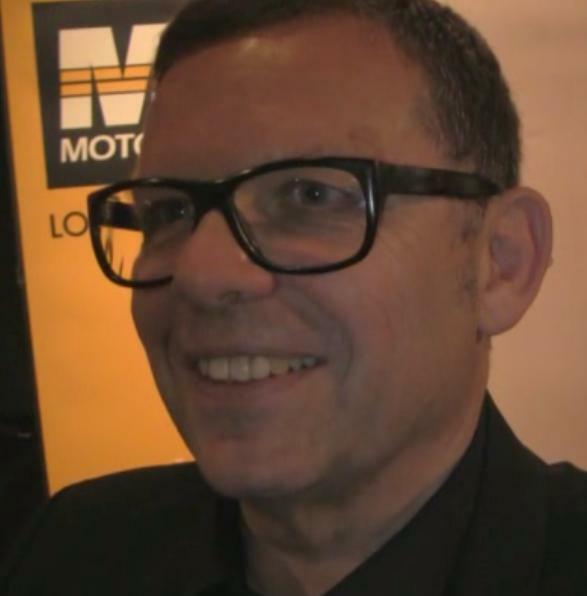 Hear my interview with Peter Schreyer at a design panel event in June 2012 where he discusses design and Kia's highly-recognizable "tiger nose". 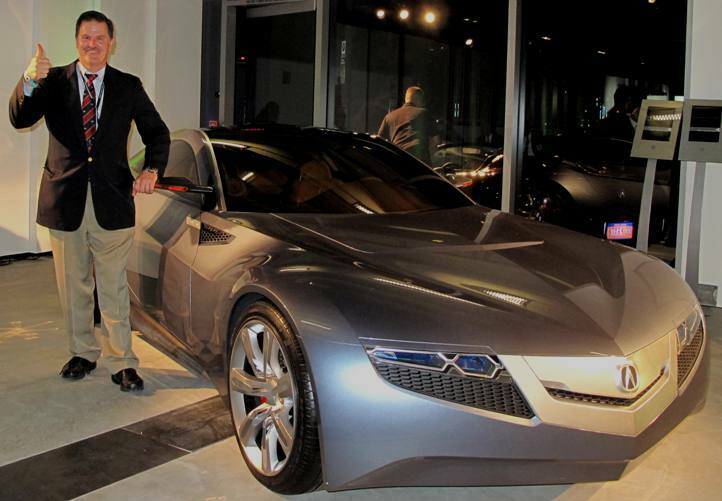 Schreyer was named Automobile Magazine's 2012 Man of the Year. Clean diesel systems offer fuel efficiency - 30 percent better than gas - and environmental friendliness - up to 25 percent less CO2 emissions with no loss of power or performance vs. gas. When it comes to cost - the diesel vehicle and fuel - are more expensive. Diesel engines are said to be very dependable, require less maintenance and have a lower depreciation rate after 100,000 miles of use than gasoline engines and hybrid vehicles. According to www.fueleconomy.gov there are now no federal tax credits for owning a diesel engine vehicle. The Volkswagen Jetta with the 140 horsepower 2.0 liter TDI diesel engine starts at $22,990 MSRP, 13.2% more than the 170 horsepower 2.5 liter gas engine Jetta SE with the convenience package which starts at $20,310. The diesel engine gets 43 miles per gallon, 27.3% better highway mileage and 30.4% better city mileage than the gas engine. 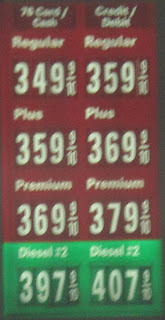 Take this recent fuel price sign in California where the unleaded cash price is $3.49 per gallon and the cash diesel price is $3.97 per gallon. Diesel costs 13.75% more than gasoline. Let's assume you drive 12,000 miles per year, half the time in the city and half on the highway. With the Jetta TDI diesel at 36mpg you will use 333 gallons, so at $3.97 per gallon will spend $1,322. With the gas Jetta at 28mpg you will use 429 gallons, so at $3.49 per gallon your annual fuel cost is $1,497. The diesel saves just $175 per year. The diesel vehicle costs $2,680 more so it would take 15.3 years for diesel to pay off despite diesel being 28.6% more fuel efficient. Also, it's a little more difficult finding service stations that sell diesel fuel. In Europe, governments subsidize diesel through lower taxes to make the pump price cheaper than gas in most countries which helps explain why more than half the cars sold in Europe are diesel. In the U.S., consumer diesel vehicle sales are fewer than hybrids at about a 3 percent market share with Volkswagen offering the most choices at affordable prices. Conclusion is that there's no major advantage in owning a diesel sedan in the U.S. with the current diesel vehicle and fuel price differences and lack of government incentives. Now if you're comparing a large SUV, like the Audi Q7, the TDI gets a combined city/highway of 22 mpg while the gas engine is at 18 mpg. At 12,000 miles per year, you're saving about $300 per year on fuel cost with the diesel but you're paying $5,200 more for the TDI vehicle, so it takes more than 17 years to breakeven. If you're mainly a highway driver then the Q7 TDI's 28 mpg highway is 6 mpg more than the Q7 gas at 22 mpg but still only saves you $312 per year in fuel cost. (Using the premium unleaded gas cost for the gas version). In any case, with the pricing, you need to own the vehicle nearly 20 years to make it pay off. I invite your comments and discussion. Thank you for your support! Wishing you a happy, healthy, warm and relaxing holiday season! 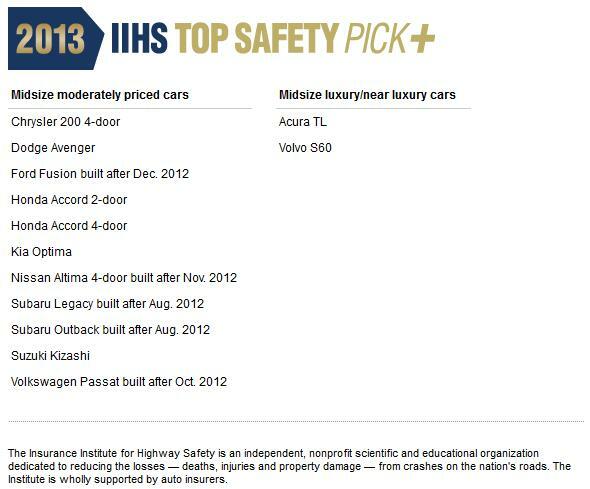 The Insurance Institute for Highway Safety is awarding the new Top Safety Pick+ accolade to 13 cars. All earn good or acceptable ratings in the new IIHS small overlap test as well as top marks in other IIHS evaluations. "Of the 29 models evaluated so far in our small overlap frontal crash test, these 13 cars offer the highest level of all-around crash protection," says Adrian Lund, IIHS president. "We're pleased to recognize them with our new Top Safety Pick+ award for 2013." IIHS rates vehicles good, acceptable, marginal or poor based on performance in a moderate overlap frontal crash, small overlap frontal crash, side impact and rollover, plus evaluations of seat/head restraints for protection against neck injuries in rear impacts. Top Safety Pick+ winners must earn good ratings for occupant protection in at least 4 of 5 evaluations, with no less than acceptable in the fifth test. For 2013, 117 additional vehicles earn Top Safety Pick. To qualify for Top Safety Pick vehicles must have good ratings for occupant protection in the moderate overlap frontal test, side impact, rollover and rear tests, regardless of their small overlap rating. Finalists for the 2013 North American Car and Truck/Utility of the Year have been narrowed down to three in each category with the winners to be announced in Detroit on January 14th. Last year the Hyundai Elantra and Range Rover Evoque were chosen. 2013 Best of the Best/Car finalists included: Cadillac ATS, Dodge Dart, Porsche 911, Porsche Boxster S and Subaru BRZ. 2013 Best of the Best/Truck finalists included: Acura RDX, Ford Escape, Infiniti JX35, Mazda CX-5 and Mercedes-Benz GL. Finalists included the 2013 Dodge Dart Aero, Ford C-MAX, Mazda CX-5 SKYACTIV and the Toyota Prius c.
The 16th Annual Strategic Vision Total Value Awards may surprise you. The all-new 2014 Acura RLX sedan, powered by an all-new 310-horsepower 3.5-liter direct-injected SOHC i-VTEC® SOHC 24-Valve i-VTEC® V-6 engine with Variable Cylinder Management, has a lightweight body structure and the first-ever application of Acura Precision All-Wheel Steer™ which is an independent and continuous control of the left and right rear-wheel steering angles for handling agility and high- and low-speed maneuverability. The next-generation AcuraLink® cloud-based connected car system also makes its debut on the new RLX. The 2014 Acura RLX is slated to go on-sale at U.S. Acura dealers nationwide in the spring of 2013 and will be available in five grades – the well-equipped RLX, the RLX with Navigation, the feature-packed RLX with Technology package, the RLX with Krell Audio package, and the top-of-the-line RLX with Advance package. Pricing details will be announced closer to launch. A version of RLX featuring Acura's new Sport Hybrid Super Handling All-Wheel Drive® (Sport Hybrid SH-AWD®) technology, producing 370 horsepower with expected fuel economy ratings of 30 city/30 highway/30 combined, will debut later in 2013. Jeff Conrad, VP of Acura Sales at American Honda shares his enthusiasm for Acura's new flagship luxury sedan. Mazda's SKYACTIV-D 2.2-liter clean diesel engine has arrived for the all-new 2014 Mazda6 and both made their North American debuts at the LA Auto Show a few weeks ago. The Mazda6 made its global debut in late August in Moscow. The Mazda6 arrives next month followed by the diesel version during the second half of the year. Mazda6 has two engine choices: the 184 horsepower SKYACTIV-G 2.5-liter gasoline engine or the new SKYACTIV-D 2.2-liter clean diesel engine with a choice of SKYACTIV transmissions in either the SKYACTIV-Drive six-speed automatic or SKYACTIV-MT six-speed manual. Final specifications and pricing for all 2014 Mazda6 models will be available closer to the on-sale date. The racing version of the 2014 Mazda6, powered by a Mazda SKYACTIV-D Clean Diesel engine, will make its motorsports debut at the Rolex 24 endurance race on January 26-27, 2013 in Daytona Beach, Florida. This will be the first time a diesel-powered vehicle of any type has ever raced at the Rolex 24 and Mazda is after their 24th class win in the American endurance classic, having most recently won in 2008 and 2010. Also announced at the LA Show was an updated CX-9 and the more powerful 2.5 liter engine choice for the CX-5. The CX-7 is no longer in the Mazda lineup. Jim O'Sullivan, president and CEO, Mazda North American Operations discusses the new Mazda6 and more. The all-new Jaguar F-TYPE two-seater lightweight aluminum architecture sports car is a front-engine, rear-wheel drive convertible coming next summer in three models: the F-TYPE with a 340 horsepower supercharged 3.0 liter V6, F-TYPE S with a 380 horsepower version of the 3.0 liter V6 and the F-TYPE V8 S with a 495 horsepower 5.0 liter V8 engine. All engines are mated to an eight-speed 'Quickshift' transmission with a centrally mounted SportShift selector offering full manual sequential control and steering wheel-mounted paddles. Jaguar Sports Cars Product Manager Tim Philippo discusses the new F-TYPE and the XFR-S shown at the LA Auto Show. The 2013 Honda Civic Sedan, the best-selling compact car in the U.S., receives all-new front and rear exterior styling, extensive interior upgrades and a host of new standard equipment just 18 months after a total redesign. Retuned steering and suspension, extensive chassis upgrades including Honda's ACE™ II body structure along with standard features including Bluetooth® HandsFreeLink®, rearview camera, Pandora® Interface, SMS text message feature, and steering wheel audio controls. The 2013 Civic has an MSRP increase of only $160 across the lineup. Pricing for the 2013 Civic LX Sedan starts at at $18,165. John Mendel, American Honda executive vice president of Sales discusses the early major upgrades to the Civic. At the LA Auto Show Honda also announced that the 2014 Accord Plug-In Hybrid earned an EPA-certified 115 MPGe rating and will go on sale in New York and California on January 15 with an MSRP of $39,7801. Separately, the Accord Hybrid, featuring Honda's new two-motor hybrid system, will launch nationwide next summer with anticipated fuel economy of 49/45/47 city/hwy/combined. The revised 2013 Honda Crosstour and 2013 Honda CR-Z also made their auto-show debuts. Nissan showed off its new line-up at the Los Angeles Auto Show, including the new 2013 Sentra, 2013 Altima and 2013 Pathfinder and the Nissan Hi-Cross Concept, which provides design cues for a future Nissan SUV according to Al Castignetti, vice president and general manager, Nissan Division, Nissan North America. The Hi-Cross Concept couples an electric motor powered by a Nissan-developed compact lithium-ion battery similar to that utilized in the Nissan LEAF electric vehicle with a 2.0-liter direct injection gasoline engine. The hybrid system is linked to Nissan's next-generation Xtronic CVT® (Continuously Variable Transmission) used on the recently introduced 2013 Nissan Pathfinder and has smaller shaft-diameter pulleys to provide the widest possible ratio coverage for enhanced efficiency. Castignetti responds to Nissan President & CEO Carlos Ghosn's call for increased sales by boasting about Nissan's "Five All-new Models in 15 Months" product revolution representing a high percentage of Nissan's volume and discusses Leaf lovers. Just three years into its product lifecycle, Kia brings the new 2014 Sorento to market on an all-new chassis that increases torsional rigidity by 18-percent. Over 80-percent of the parts in the 2014 Sorento are either all-new or significantly redesigned, including a new 290 horsepower 3.3-liter GDI V6 engine and a substantially redesigned interior and a next-generation infotainment system with Kia’s next-generation UVO eServices voice-activated telematics system. There are now four trim levels: LX V6, EX V6, SX and SX Limited. The SX Limited is new and will arrive within the second quarter of 2013, shortly after the arrival of the other new 2014 Sorento models. Steve Hirashiki, Senior Product Strategy Manager at Kia Motors America describes the new 2014 Sorento. Jacob Harb, BMW's North American Manager of Electric Vehicle Sales and Strategy, says the i3 Concept is closer to reality though the actual model, expected in about a year, will be a 4-door version of the BMW i3 Concept Coupe shown at the LA Auto Show in the world premiere. Andres Valbuena, Product Manager at Volkswagen of America, discusses new Beetle Convertible offerings at the LA Auto Show. The New Beetle Convertible is the third-generation Beetle Convertible with three special editions from the 1950s, the 1960s, and the 1970s. The ‘50s Edition Beetle Convertible is black with a tan interior, the ‘60s Edition has two-tone seats and Denim Blue paint and the ‘70s Edition Convertible has a Toffee Brown exterior and chrome-look disc wheels. Compared with the 2006 version of the older car, the latest Beetle Convertible is 3.3 inches wider at 71.2 inches; 1.1 inches lower at 58.0 inches tall; and 6.0 inches longer at 168.4 inches overall. The 2013 Beetle Convertible offers a 170 horsepower 2.5-liter five-cylinder engine mated to a six-speed automatic transmission with an EPA estimated fuel economy rating of 21 mpg city and 27 mpg highway. There's also a 200 horsepower dual-overhead-cam, 16-valve 2.0-liter TSI turbocharged four-cylinder gasoline engine with six-speed manual or six-speed DSG® dual-clutch automatic transmissions getting an EPA-estimated fuel economy of 21 mpg city and 29 mpg highway. The third choice is a 140 horsepower 2.0-liter TDI turbocharged Clean Diesel with the same manual or DSG options which gets an EPA estimated fuel economy rating of 28 mpg city and 41 mpg highway with the manual transmission. The Beetle Convertible has a starting MSRP of $24,995. The ‘50s Edition costs $26,095. The Beetle Convertible with Technology starts at $26,695. The Beetle Convertible with Sound and Navigation starts at $28,495. The ‘70s Edition has an MSRP of $28,595. Beetle TDI Convertible starts at $27,895. The Beetle TDI Convertible with Sound and Navigation has a base price of $29,195. The Beetle Turbo Convertible starts at $27,795. The Beetle Turbo Convertible with Sound is $29,195. The Beetle Turbo Convertible with Sound and Navigation starts at $31,195 and the ‘60s Edition is priced at $32,395. The are on sale this month. The all-new Land Rover flagship fourth generation Range Rover is on display at the LA Auto Show following its UK introduction in early September. The Range Rover keeps much of the original design from over 40 years ago with a very similar footprint to the outgoing model but now has a lightweight all-aluminium body and a rear compartment that offers more space. Simon Turner, Manager Service Engineering Support and Tech Center at Jaguar & Land Rover was on hand in L.A. to discuss the new vehicle. Bill Fay, group vice president and general manager of the Toyota division at Toyota Motor Sales U.S.A. discusses the all-new Rav4 at the LA Auto Show. So far this year 157,526 Rav4s have been sold in the U.S., a 33.3 percent increase over last year. The all-new 2013 RAV4, the fourth-generation Rav4, made its world debut at the 2012 Los Angeles International Auto Show and arrives early next year. RAV4 will be available in LE, XLE and Limited with a 176 horsepower 2.5-liter four-cylinder engine mated to a new six-speed transmission. RAV4 front-wheel-drive models have received EPA- estimated fuel efficiency ratings of 24 mpg city/31 highway, while all-wheel-drive models are EPA-estimated at 22 mpg city/29 mpg highway. All 2013 RAV4s will have eight standard airbags and feature the Star Safety System, which includes Traction Control, Electronic Brake-force Distribution, Enhanced Vehicle Stability Control, Brake Assist, an Anti-lock Braking System and Smart Stop Technology. Standard on all RAV4 models is a Display Audio with a 6.1-inch LCD touchscreen and includes a standard backup camera and Bluetooth connectivity. When shifted into reverse, the audio display will show the image of what the backup camera captures. Philip Jansen, the Chrysler Vehicle Line Executive for the this segment size discusses the new Fiat shown at the LA Auto Show. The all-new 2014 Fiat 500L offers more than 42 percent more interior space than the two-door with seating for five, powered by a 160 horsepower 1.4-liter MultiAir Turbo engine with two six-speed transmission offerings. The all-new 2014 Fiat 500L and all-new Fiat 500L Trekking models are produced at FIAT Automobiles’ manufacturing plant in Kragujevac, Serbia and will arrive to FIAT Studios in North America in mid-2013. General Motors reported its highest November sales in the United States since 2007, with sales of 186,505, a 3 percent rise over last year. Year-over-year sales are 2,349,984, a 3.3 percent increase over 2011. Ford's total November sales of 177,673 was a 6 percent increase versus last year, with retail sales up 12 percent. Year-to-date Ford sales are 2,035,943, a 5 percent gain over 2011. Toyota Motor Sales, U.S.A. reported November 2012 sales results of 161,695, an increase of 17.2 percent compared to the same period last year. The Toyota Division posted November total sales of 138,976, an increase of 17.3 percent from November 2011. Year-to-date sales are 1,888,361, a 28.8 percent increase. Chrysler reported U.S. sales of 122,565, a 14 percent increase compared with sales in November 2011 (107,172 units), and the group's best November sales since 2007. Year-to-date sales are 1,499,420, 22 percent higher than 2011. American Honda reported an all-time record for the month of November, with sales of 116,580, an increase of 38.9 percent compared with November 2011. The Honda Division posted November 2012 sales of 104,334, an increase of 41 percent compared with November 2011. Acura U.S. November sales of 12,246, an increase of 23.6 percent over November 2011. Year-to-date American Honda sales are 1,290,011, a 23.8 percent increase. Nissan North America reported record November U.S. sales of 96,197, up 12.9 percent. Nissan Division set a new November record, with sales up 9.8 percent for the month over the prior year at 84,300 units. Sales of Infiniti vehicles were 11,897, up 41.2 percent over the prior year, also a November record. Year-to-date sales are 1,042,366, a 10.7 percent rise over last year. Hyundai Motor America announced record sales of 53,487 vehicles in November, an eight percent total sales increase compared with the same record-setting period a year ago. Sales are 643,572, also up eight percent for the first eleven months of the year. Kia Motors America November sales was its 27th straight month of record sales with 41,055 sold, a 10.9-percent increase over the same period in 2011. Year-to-date sales are 518,421, up 17.3 percent over 2011, and Kia sold its 500,000th vehicle in 2012, for the first time ever in a single year in the U.S.
Volkswagen of America reported sales of 36,728 in November, a 29.3 percent increase over prior year sales, and year-to-date sales of 291,900, a 35 percent increase and the best November since 1973. Separately, Audi reported November sales of 12,067, a 24.4 percent increase over the same month a year ago with year-to-date sales of 124,469 vehicles, up 18.6 percent, eclipsing the annual sales record set last year. Mercedes-Benz USA reported an all-time sales record with November sales of 32,649 for combined sales of Mercedes-Benz, smart and Sprinter models, up 15.6 percent and delivering a record year-to-date total of 273,622 up 14.5 percent. The Mercedes-Benz model line alone recorded its highest November on record with sales of 30,315 for the month, up 13.1 percent, and 245,910 for the year up 12.0 percent. Subaru of America reported 28,206 sales for the month of November, a 60 percent increase over November 2011. The company also announced record-breaking annual sales of 299,788 vehicles which represent a 28 percent increase over 2011 and just 222 vehicles short of achieving 300,000 sales for the first time in company history. Following the November close, on Dec. 1, 2012, Subaru achieved the 300,000th sales milestone for the first time in company history. The BMW Group in the U.S. (BMW and MINI combined) reported November sales of 36,461 vehicles, an increase of 38.8 percent from the 26,271 vehicles sold in the same month a year ago. Year-to-date, BMW Group is up 11.3 percent on sales of 303,728 in the first eleven months of 2012 compared to 272,873 in the same period in 2011. Mazda North American Operations reported November U.S. sales of 21,691, an increase of 17.7 percent versus last year. Year-to-date sales are 249,795 through November, up 9.1 percent versus last year. Porsche Cars North America announced a record November 2012 sales of 3,865 vehicles, an increase of 71 percent. November 2012 was the best sales month ever for Porsche in the United States. For the year, Porsche has sold 32,091 cars in the U.S., an 18 percent increase over the same period last year. Mitsubishi Motors North America reported November sales of the Outlander Sport were 1,520, up 34.2 percent compared to November 2011. American Suzuki Motor Corporation reported November 2012 sales of 2,224 units, a 22 percent increase compared to the same period last year. Sales with be updated as manufacturers report.